�Help me bring supers back into the sunlight�. After all these years and sitting through three �Cars� movies - The only sequel that needed to happen has finally happened. It couldn't come quickly enough. Because I cherish �The Incredibles� on multiple repeats when I was little. Also losing count of how many times I've played the PS2 game version. So yeah, this meant the world to me and anticipating a sequel for a long time, just like everyone else. 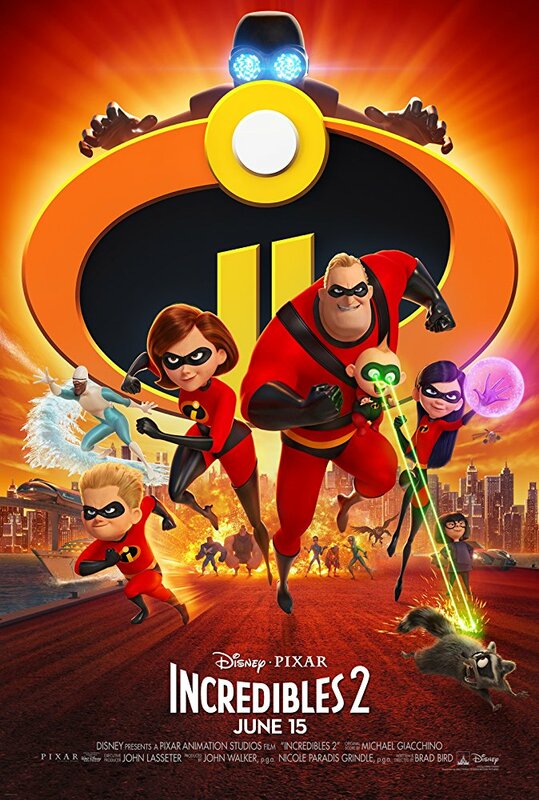 While �Incredibles 2� doesn't quite hold a candle to the first, but still, I liked it. There�s a lot to like and enjoy. And yet recognize it�s flaws as well. It's not a disappointment, which makes me happy, just judging by Pixar recent involvement with it�s sequels. Brad Bird is a talented film marker and storyteller, both in animation and live action. In animation however is where he really shines. Bringing a rich style of nostalgia that clearly influenced his personal life - Going back to the golden age of cinema and inputting into his work. Same thing applies with this movie and managing to keep the level of quality strong after all these years. The animation was great, now that�s nothing new, yet this needs repeating. It�s bright, colorful, and full of life. Pixar always succeeds in animation. The choreography during the action sequences was energetic and exciting with the animation being glue to hold it altogether. The character�s screen time is perfectly balance so you got to see just enough of everyone. Probably the most enjoyable part of the whole movie is watching Bob (Or Mr. Incredible, if you like) trying to take care of his kids. I think the reason why is the family dynamic and the reverse roles in that situation. Most of the heart and humor are in those scenes. I mean, it�s better than the actual plot itself involving Elastic girl. Now this ties in with my main issues: The villains are paper thin and painfully generic. I don�t want to spoil anything, but then again, the movie basically spoils itself from having a predictable narrative. When the villains motivations are revealed it�s pretty ridiculous and you just don�t buy it. I wished this wasn't a continuation from the first, especially when you notice the actors who voiced these characters sound much older, since this takes place immediately after the original. It would've been a lot better if it was set years later in a new time period, where more homages to campy superhero movies and TV shows, because around the 60�s or 70�s, the genre itself got more corny, but also gives Pixar more material to work on and have a creative spin on it. I know it may seem unfair to keep comparing this to the first, but this movie does everything it can to remind you of the first film, including plot points- So not really. Oh and is it just me, or dose Catherine Keener character model looks exactly like Roxanne Ritchi from �Megamind�. Overall rating: �Incredibles 2� is a good movie and came out around the perfect time where superhero movies are bigger than ever. I can safely say it was worth the wait. Again, not quite as clever or excellent, although I am glad we finally got a sequel, good or bad. I�ll see you in 25 years.